One of the more popular pages at the Zhodani Base is the Random Subsector Generator. 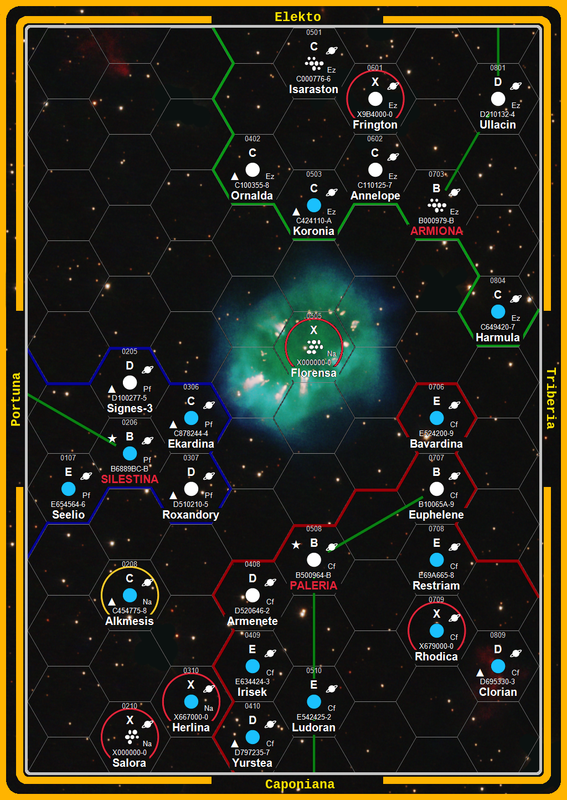 With the help of the generator, some text editing and the post function at Traveller Maps and some editing using Gimp, I created this subsector. I made this subsector to try out the region xml-tag that is used at TravellerMap for nebulas. But then I liked the subsector that I have made, so I decided to make it prettier using an image of a real nebula. Three interstellar powers are present in the subsector. The Portuna Federation, the Caponiana Free State, and the Elekto Zardom. 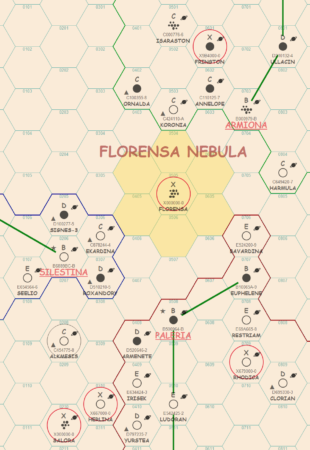 All three interstellar powers have signed an agreement that have defined the Florensa Nebula as a space preserve. No ships are allowed to go there except for scientific missions. Silestina is the local capital of the Portuna Federation. 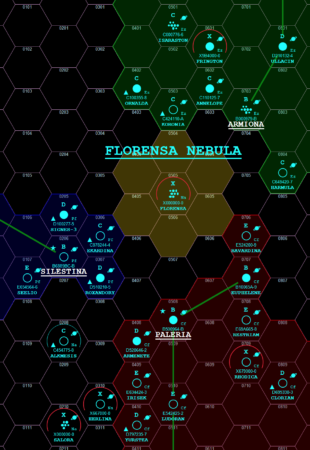 Trade in illegal gems from the Florensa system has attracted lots of settlers. The planet is ruled by Duke Ostretto who is not very popular and that have risen the law-level to C to protect himself. At Florensa there is a thin asteroid belt orbiting a neutron star at 80 AU. There are a few research stations in the belt. These stations observe the neutron star and the nebula. The stations are usually unmanned. In some areas of the Nebula, there are lots of valuable minerals. It is possible to find gems like Diamonds or Sapphires. There are also noble metals like Platinum, Gold, Iridium, and Osmium. Some radioactive can also be found. In a few locations in the nebula, 2000-year-old (non-human) mining equipment have been found. Due to micrometeorites and radiation, these doesn’t work anymore, but they seem to have been more advance than what any of the current interstellar powers can produce. Paleria is the local capital of the Caponiana Free State. Trade in illegal gold from the Florensa system has attracted lots of settlers. 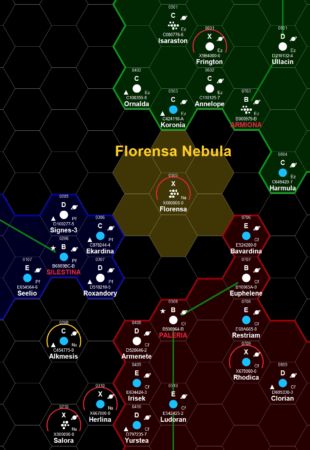 Paleria is controlled directly from Caponiana. Armiona is working as some kind of local capital of the Elekto Zardom. Armiona is a huge asteroid belt and each asteroid have its own government. There is no central control. Trade in illegal radioactives from the Florensa system has attracted lots of settlers.